Based on a recent reader’s comment, I got to thinking about the best helmets of all time. The following is my opinion on the matter. 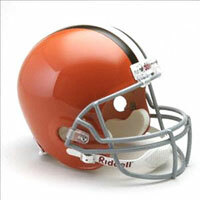 I can’t for the life of me figure out why the ‘Skins don’t still wear this helmet. It’s vastly superior in my opinion the current version. 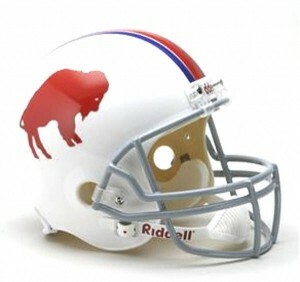 I actually don’t have that big of a problem with the current Bills helmet, but this classic, neat look is superior in my opinion. The stripe running from the current charging bills’ horn never quite made sense to me. 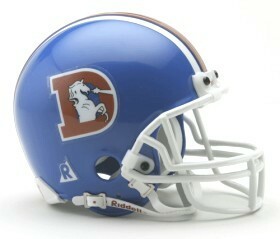 Are you going to tell me that John Elway is remembered in that new age helmet? No way. This one’s got the funky blue-orange combination plus the laser beam snort from the bronco; classic. 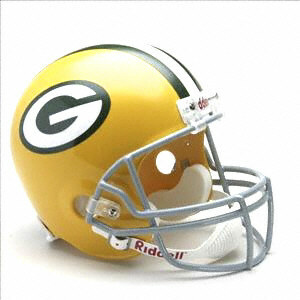 The helmet of Joe Willie Namath defeating the Baltimore Colts and Johnny Unitas. 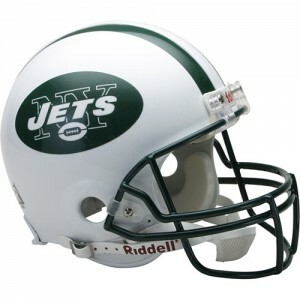 Good decision by the Jets to dump the kelly green version and go back to their roots. Understated, simple, and classic. 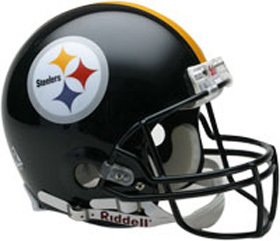 There’s no good reason for me to love this helmet, but I respect the fact that they’ve stuck with it for so long despite the varying trends around the NFL. 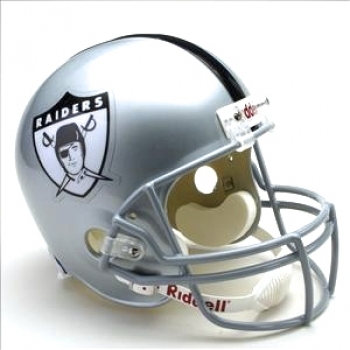 You have to love the silver and black, despite the Al Davis factor. The Oakland Raiders have left their timeless look relatively unchanged, except for some minor logo and face mask color waffling. I absolutely love this helmet. Aesthetically, it has no rival. The black falcon on red helmet works so well. Atlanta should absolutely switch back to this gem full time. The famous horseshoe with the blue strip down the middle. Just stay away from the blue face mask version and it’s an all-time classic. This helmet very nearly took the top spot. Lambeau Field, Vince Lombardi, Bart Star. It belongs in the annals of football lore. 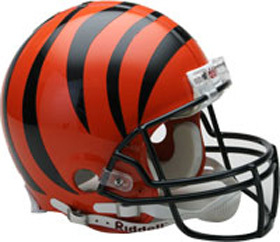 For my money, you just can’t do better than this helmet. It drips with history, tradition, and is very aesthetically pleasing. This helmet simply means business. To this point, that business has been winning Super Bowls and looking snappy while doing it. There’s no other helmet quite like it, but in the end it’s just too busy to be in the top ten. In all honesty, the Cowboys should really be in the top ten, but I just hate Jerry Jones too much. 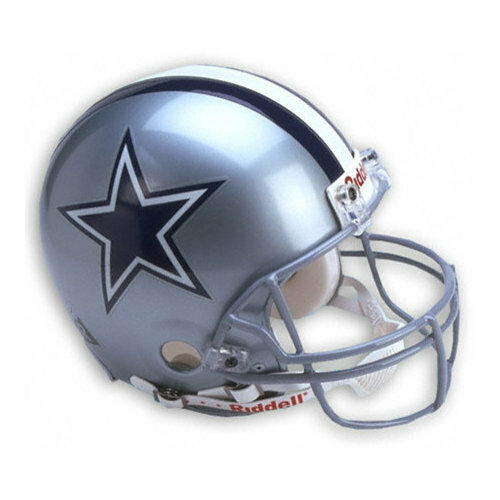 As for the helmet, the classic silver and blue with the star logo is an NFL mainstay. Those Jets helmets are so damn ugly,and the logo looks like something someone who is 8 years old made.Those green helmets with he Jets logo with the plane coming out was awesome.The steelers helmet would be better first off is they put the damn logo on the other side of the helmet as well.I wonder if the moron who designed those old Atlanta Thrashers hockey jerseys with the stripe on only one side of the sleeve was the same guy who came up with the idea that the steelers should put the logo on only one side of the helmet.Weird thing is when they switch sides on the field and they have nothing on the other side of the helmet,it almost looks like a different team.Also they should have a gold face to match the pants.The Colts need to bring back the blue face mask,they gray is so damn ugly and matches absolutely nothing on the uniform.Love the Falcons red helmet.The browns need to either have a white,orange or brown face mask,not gray.The Raiders should actually switch to a black face mask,and the Cowboys should switch to a Navy Blue face maskLove the old Broncos helmet.Facemask looks good white or even orange for that matter.Bengals helmets just rock.Don’t like those Bills or Red Skins helmets.I would have put the Saints,Eagles,Lions,and Seahawks,maybe on that list too. I could not agree more, the Colts grey facemask is horrible. It ruins the entire look of their uniform and helmet. The only thing worse are the Browns. For Gods sake, go back to the white or even brown facemask. Their can be no rational reason for either team to have grey facemask. 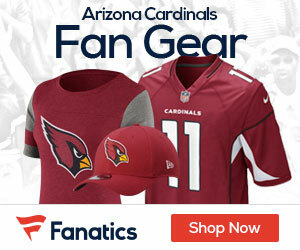 The Cardinals should have red face asks. In the name of all that’s holy, make these changes now!